Kaydon engineers have engineering experience and expertise—on average, each has 20 years experience in bearing engineering. It's no wonder Kaydon engineers have a proven track record of solving the world's most demanding bearing challenges. Typical bearing suppliers provide standard solutions and average performance while requiring a high minimum order quantity. The Kaydon process is different. Our engineers are accessible and flexible, applying their expertise whether it's a catalog bearing or custom, and whether the order is for one or thousands. Kaydon engineers specialize in a given industry (e.g., aerospace, medical, heavy machinery) and, unlike at other suppliers, follow a project through product design, manufacturing, and testing. This provides an in-depth understanding of product and material performance and selection. When customers require stronger, lighter, smaller, faster, and/or quieter bearings and assemblies, they know they can count on Kaydon engineers for the ideal application-specific solution. Kaydon's engineering expertise is apparent in all of our offerings. Thin section and slewing ring bearing solutions meet the highest quality standards and are available with a wide variety of materials, sizes, separator types, and more. Kaydon's research, development, and testing labs evaluate and verify product performance with exhaustive testing. Our free Reali-Design® engineering aid software computes essential life and load analyses (and much more), significantly saving you time. 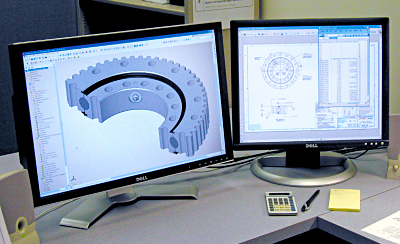 To find out how Kaydon can help solve your bearing challenges, contact us at 800.514.3066 or submit a data specification sheet for custom bearings or custom slewing ring bearings.